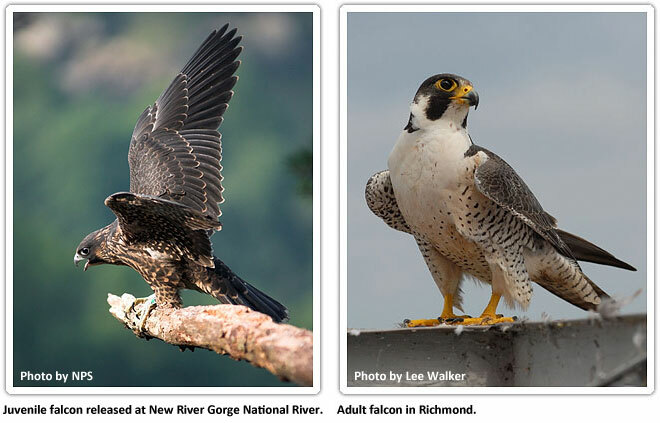 The peregrine falcon belongs to the Falconidae family of birds. With close evolutionary ties to hawks, this family counts 7 regularly-occurring species among its North American members. Peregrines are medium sized raptors with long pointed wings and a long, narrow tail. They are easily recognizable through the characteristic dark crown and nape and dark “sideburns”, which are features of all plumages. Adults have blue-gray to brown-gray upperparts and barred belly and legs. Underparts vary from bright white to buff. Young birds have dark brown upperparts, a buffy breast and belly, and dark, vertical streaking across the breast and belly. The peregrine enjoys an essentially world-wide distribution; it is absent as a breeder only from the Amazon Basin, the Sahara Desert, the steppes of central and eastern Asia, and Antarctica. Three peregrine subspecies have been described in North America: Peale’s peregrine (F. p. pealei) is the largest and darkest in color, and inhabits the island chains of the Pacific Northwest; the Arctic peregrine (F. p. tundrius) is a small, pale, highly migratory form that breeds in the arctic tundra of North America and Greenland; and the American peregrine (F. p. anatum) is intermediate in size, color, and migratory behavior. Its range extends across the continent, reaching that of tundrius in the north and extending south to north-central Mexico. The peregrines that originally inhabited western Virginia were of an anatum subpopulation known as the Appalachian peregrine. Those birds were larger and darker than others of the subspecies.